November 10, 1929 — Handbill promoting an appearance by E.O. Mickel and family at the Cumberland Street Methodist Episcopalian Church in Philadelphia. 6x8 inches, one-sided. The young man in the picture is Montie Montana, the world-famous trick roper who moved to Agua Dulce in 1976 and lived there for the last 22 years of his life (except for a brief stay in Palm Springs, which didn't suit him). Montie started life as Owen Harlan Mickel on June 10, 1910, in North Dakota (not Wolf Point, Mont., as often reported). He was born to a pair of traveling Western entertainers — Edgar Owen Mickel and Mary Edna Harlan Mickel, who had a popular whip act. 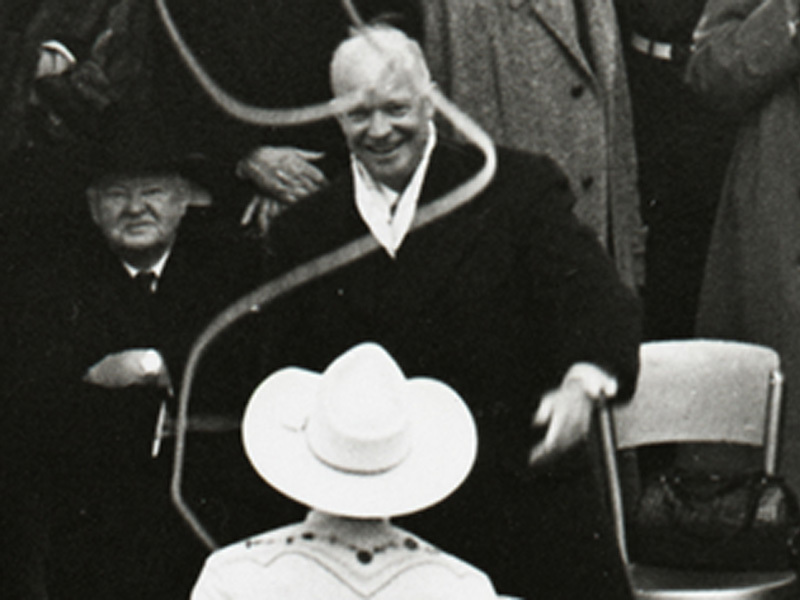 Montie quickly learned to trick-rope. Edgar was also an adept orator who knew how to preach the gospel, and he had a magic lantern and a collection of slides. He'd use one or more of these talents depending on the audience. Montie writes: "Dad was such a happy, enthusiastic man, and everyone liked him. E.O. Mickel just never met a stranger. He would give a talk at churches, schools or club houses, and show his slides of cowboys, Indians and Yellowstone Park. This went over real well because the people just didn't travel or get to see much in those days. I would trick rope and we made enough to keep traveling around the country" (Montana 1993:25). 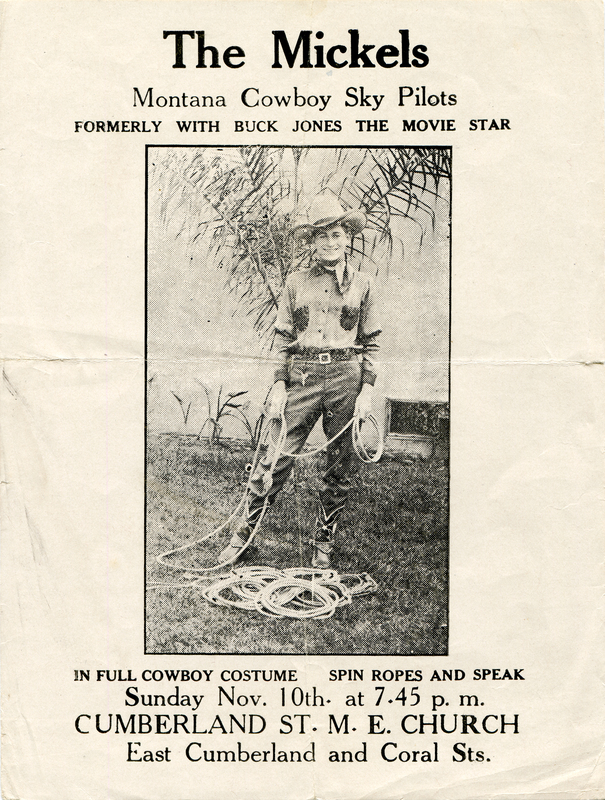 The Mickels / Montana Cowboy Sky Pilots / Formerly with Buck Jones the movie star / In full cowboy costume / Spin ropes and speak. A "sky pilot" is a horseback preacher. The date and the city aren't shown. We know it's Philadelphia because that's where there is a Cumberland Street Methodist Episcopalian Church at East Cumberland and Coral streets. The Mickels performed with Buck Jones' Wild West Show until the first part of 1929. In fact, that's where Montie got his stage name. He'd always called himself Montie — he didn't like his given name — and one day Jones' announcer forgot his surname and called him "Montie, the Montana Kid." It stuck. Since we know they were "formerly" with Buck Jones, we know it's no earlier than 1929. In his autobiography, Montie includes pages of log books in which he kept a record of their performance venues. The last four months of 1929 and the last three months of 1930 aren't shown. The years 1931 and 1932 show the family remained in the L.A. area. In fact, they performed at Hoot Gibson's Saugus rodeo in the springtime and at other rodeos in which Gibson and promoter Bob Anderson were involved throughout the year, all in the Southland. In 1933, Montie got married (Buck Jones was his best man) and he didn't leave the West Coast. He also went his own way at this time, leaving his parents behind as he performed with bigger and bigger shows, circuses and rodeos. That leaves either 1929 or 1930, and November 10 was a Sunday in 1929. It was a Monday in 1930. So it's 1929. LW2559: 19200 dpi jpeg from original handbill purchased 2013 by Leon Worden.